“Francofonia” was this years “might as well”-movie. Every year, when I do my Viennale planning, there is the occasional gap between two films. Since I usually don’t feel like strolling around or sitting in the lobby for three hours, I tend to watch whatever is showing in between. 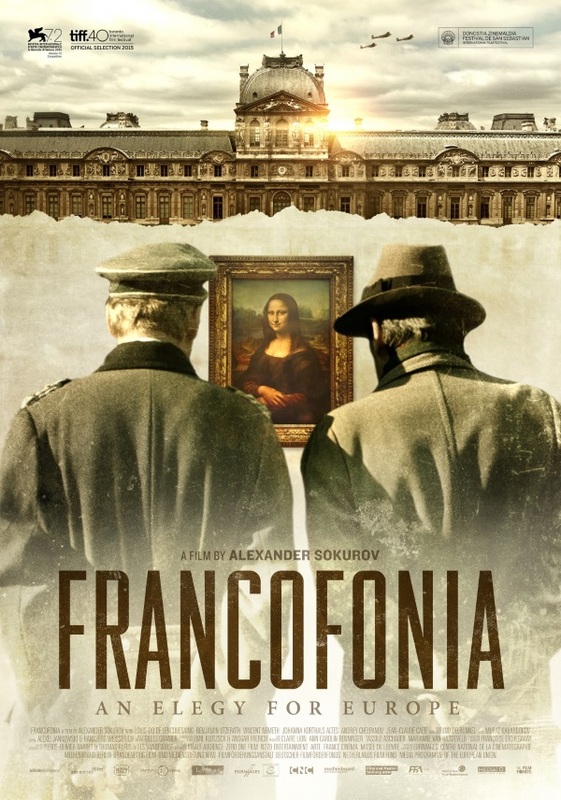 Which also means that originally, I didn’t plan on seeing “Francofonia”, and it actually was one of the movies that I discarded quite early, since it didn’t really look and sound like my cup of tea. And even though I don’t regret having seen it, my original assessment was pretty much confirmed. If you’re into art and/or history – and preferably art history – then this is the film for you. Probably. Unfortunately, I’m not, which is why I mostly had a hard time with it. Not that “Francofonia” would have been completely without its merits. There were a couple of things and scenes that even I very much enjoyed, like the moments were, thanks to the lightning as well as the movement of the camera, the paintings almost seemed to come to life. Also, even though I might not be the biggest history buff, I found some of the revelations about Paris – and the Louvre – during the Nazi occupation quite interesting. I also loved the archival footage, especially the shots of Adolf Hitler driving through Paris, looking for the Louvre. And a couple of scenes were visually quite stunning, like when the current landscape around the Louvre transformed into how it looked 100 or 200 years ago. Finally, I have to admit that even though it wasn’t quite my cup of tea, at least “Francofonia” was quite original, something special, and definitely something that I haven’t seen before. Unfortunately, there also were quite a few things that I didn’t care much about. “Francofonia” and I already were off to a rather rough start with the extremely annoying and weird beginning, when doors open up and behind them we see portraits of famous painters, like they would wait for us and/or sleep in the apartment next door. That was far too surreal for me. I also didn’t quite get the meaning behind the framing story concerning the art objects on the ferry that gets into a storm. I actually was already about to leave the theatre (and probably would have, if the whole movie would have been like those first couple of minutes), when things finally started to get interesting. Nevertheless, overall, it was far too long for my taste, and thus got quite tedious, especially during the middle part. It doesn’t help that Sokurov (who narrates the movie) himself seemed to think that he’s wearing us out, and suddenly out of nowhere announces something like “Don’t worry, I won’t try your patience much longer” – however, it felt like this comment came in the middle (!) of the movie, thus “Francofonia” continued for quite a while after that announcement, which didn’t help with my increasing impatience. I also had no use for the scene where Sokurov steps into this depiction of historic events, and kinda sits down with the past curator of the Louvre and Prince Metternich, and reveals to them their ultimate fate. I also could have done without the appearances of historic figures like Napoleon, who talk directly to the audience. The whole film, unfortunately, feels extremely artificial, and overall, seemed like an exercise in artiness to me. And despite a couple of nice moments scattered throughout, as a whole I found “Francofonia” to be more tiresome than exciting. In conclusion: Apart from a couple of visually stunning scenes (that I would have otherwise missed), I probably would have been better off reading the Wikipedia-article. However, if you’re interested in the topics that “Francofonia” deals with, I recommend you give it a chance. This entry was posted in cinema 2015, movie reviews, new releases, Viennale and tagged 2015, Aleksandr Sokurov, Francofonia, Viennale, Viennale 2015. Bookmark the permalink. The “sleeping painters” are Chechov and Tolstoj, pretty much dead in the photos, so maybe you would have gotten a different impression and knowledge of the film had you known that fact. Actually, I’m pretty sure that they even mentioned who those painters were, but I didn’t recall when writing my review. But yeah, undeniably, if I’d be more of an art guy, this movie definitely would have spoken to me more ;-).